Historical centre of the town, the citadel is a quiet and authentic neighbourhood. You will appreciate this spacious apartment,completely refurbished in in an old building (XVI th century), decorated with care for a comfortable and pleasant holiday. New Official ranking : 3 stars, 3 keys Clévacances. One single bed in the alcove provides an "independent" bedding, and in the vaulted room (28 sqm), you'll find one double bed (4ft6)and one sofa-bed for two. The flat will altogether sleep up to 4 persons, with good quality slatted-bases and mattresses. An ADSL internet connection will also provide telephone facilities and 78 TV channels (included in the rent). Between the sea and the mountain, Bastia is the ideal base to visit the country around and practice all kind of outdoor activities. But you can just walk and discover the picturesque old town and enjoy all the city facilities : shops, restaurants for all tastes, bars, discos, cinemas, theatre and various cultural and musical events. A parking place will be available for your car in the new public parking of the citadel. During cold season, heating will be charged. We enjoyed a very nice 6 day stay in Bastia. We were warmly received by Carol and made to feel welcome at the apartment. 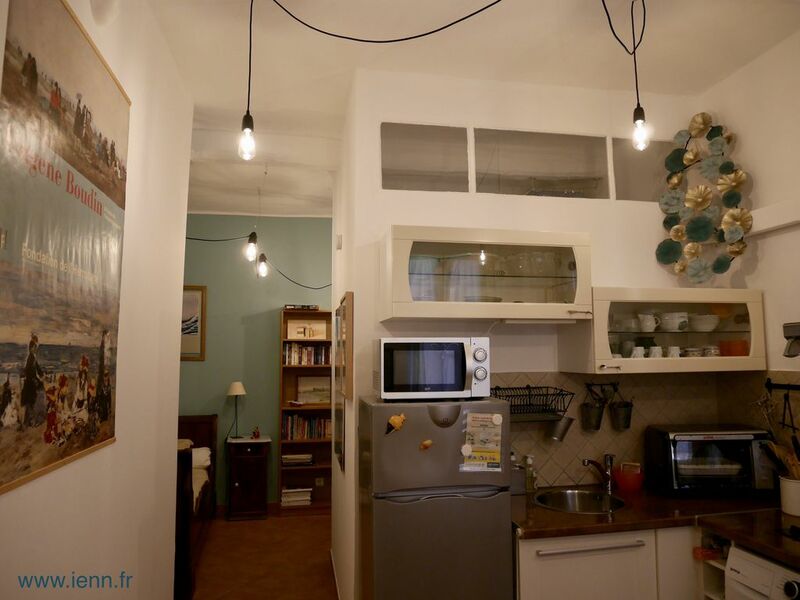 Situated very close to the citadel and city centre we were able to take advantage of the waterfront and port area of Bastia. As a couple with two children we had ample space and the apartment was well equipped. Thank you for a wonderful stay Carol and we hope we are able to return. "Most interesting apartment in an excellent situation. The apartment was very clean, comfortable and well equipped. Within two minutes there was a choice of bars and restaurants and a supermarket and Post Office. We loved the whole area and would like to return." "A truly beautiful apartment. The photos just don't do it justice. Carol was professional, helpful and very, very kind. She picked us up at the railway station, offered to wash our clothes - even took us on a day's tour of the best local sites. Couldn't ask for more. One of the best holidays we've ever had, and Carol's kindness and fantastic apartment was a big factor in a tremendous holiday." The kitchen was fully equiped, shower and the toiled worked well, all in all the flat was in very good condition. Not to mention the groovy ceiling in the living room. The size was perfect for two people, but I could imagine one or two more would also fit. The Citadelle (old town) is a lively neighbourhood, but in a good way. The people are friendly and there are some really nice views too. The owners were actively involved to make our stay succesful. They offered both good advise and a few trips around Cap Corse, which was really nice. Très bon séjour appartement très agréable et au calme. Nous avons pu visiter tous ce que nous voulions. Merci à Carol pour son accueil. L’apparrelent correspondait en tout point à l’annonce. Il est très agréable et très bien situé pour une visite complète du cap corse. L’accueil de la propriétaire été formidable. La place de stationnement dans le parking de la citadelle est un plus indéniable. From the continent : by boat or by plane. Reaching Bastia city, follow the signs "Centre ville" and/or "La Citadelle". You'll find in the flat a number of booklets published locally, which will inform you of the varous activities and events proposed to you in the vicinity (sports, concerts, sea promenades...).